Feyonda Fitzgerald scored a conference record 30 points in Saturdays game. Photo courtesy of Temple Athletics. The American Athletic Conference – and its tournament – is dominated by Connecticut, which has never lost a game in conference play. In the AAC’s last two years (since Louisville departed), South Florida has been the only other high-level team, often nationally-ranked, to make the NCAA tournament as an at-large team two of three years. This year, No. 2 seed Temple, not USF, is the best of the rest, ranked at No. 25/21, and boasting a 23-6 record, 13-3 in conference. The first two days of any mid-major tournament is likely to be a mix of close games and blowouts, and either of those can be good or bad basketball. Especially on the second day, upsets are rare. The tournament field this year included four teams with identical 7-9 league records. The league boasted a season where any team four through eleven, can beat any other team. The first two days of this tournament were a little bit of both. Several generally poor games with exciting endings, an upset, and an unwatchable slogging game. Short game commentary on the first two days follows, but first, a few general observations around the venue. What’s happening around the tournament? BASKETBALL ROYALTY IN THE HOUSE: I was thrilled to see Katie Smith doing commentary for ESPN for half the tournament games, which also meant she was on the sidelines for the other half. Smith holds the scoring record for US professional players with an astonishing 7,885 points in her 17-year career. A three time Olympian, an All-American at Ohio State and one of my favorite players of all time, it was a thrill to chat with her between games. 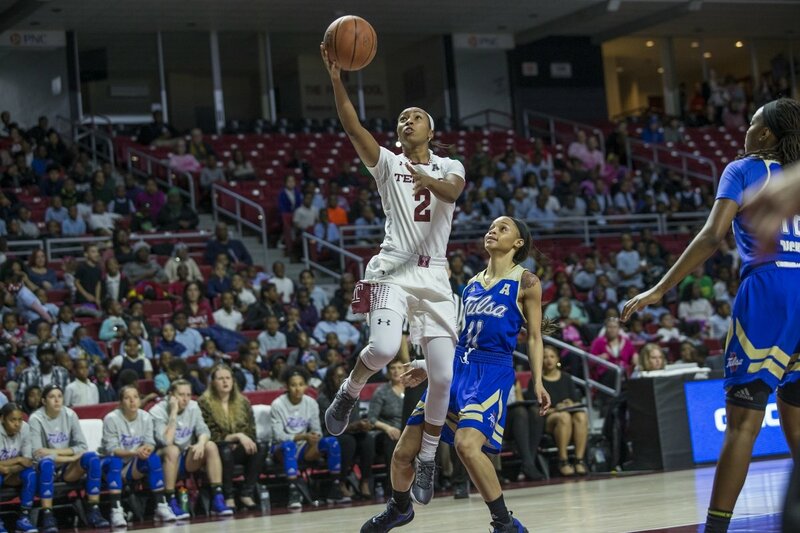 NEW TOURNAMENT SCORING RECORD: Temple’s Feyonda Fitzgerald owned the fourth quarter of a close quarter-final match against Houston, and finished with a tournament-record 30 points as Temple moved on to the semifinals for the first time. American Athletic Conference associate commissioner Barbara Jacobs swept the floor between rounds of the conference tournament. Photo by Jim Clark. 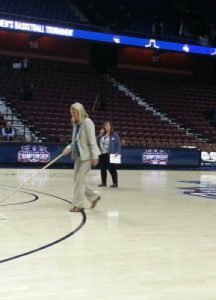 CLEANLINESS IS NEXT TO GODLINESS: You know you are in a mid-major conference when the Associate Commissioner, Barbara Jacobs – the head honcho of women’s basketball – sweeps the court between games three and four on the second day. That’s a Jill-of-all-trades, and a sign of a league that watches its budget carefully. A ROUGH START TO MEDIA RELATIONS: This is the conference tournament, with more opportunities to showcase an improving league than at any other time of year. Appearances matter. Preparation matters. Ordinarily, each team creates a package of material for the media before each game that permits writers not familiar with the teams to learn about the players and the season. Houston had no packet. Cincinnati did, but in the first round it was missing 17 of 37 pages. Because this was the first day of the tournament, the teams/league had four days to get it right. Apparently no one on either team or from the league noticed the errors. It may seem like a small thing, but I have not seen dual errors like that before in the 21 years that I have been covering women’s basketball. It is embarrassing, or should be. To the staff’s credit, they fixed this on day two, and there were no further issues with paperwork. HOW LIKELY IS THIS MATH? Both AAC Player of the Year and Coach of the Year were shared awards this year. 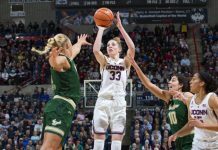 UConn’s dynamic sophomores Napheesa Collier and Katie Lou Samuelson shared POY, while UConn’s Geno Auriemma and Temple’s Tonya Cardoza shared the COY. So, eleven coaches vote for post-season awards, and cannot vote for players on their own team, or of course for themselves. The math could be really complicated, but in the simplest scenario, each of the POYs received five first-place votes, and five second-place votes and one third-place vote. How likely is that? Day two, Saturday: The second day of the tournament was proof that games can be close and even exciting, without being great games. This was a close game, with the largest lead in the first half six points, and in the second half, seven. Unfortunately, it was also completely forgettable game through three periods. Entering the fourth quarter, the score was 34-33, and each team had more turnovers than baskets. With ten minutes left, the real teams suddenly emerged. Central Florida shot 67 percent (8-12) for the quarter, Tulane 60 percent (9-15) there were two tenacious basketball teams on the court. The score was tied at 48 with 2:41 remaining. The lead changed three times in the final minutes, and Tulane, sliding slowly behind, cut five and four-point deficits to two points before running out of time. UCF, which was a miserable 3-10 from the free throw line, hit ten of fourteen to cement the victory, including 7-10 in the final minute. Tulane junior Kolby Morgan led all scorers with 25 points (8-10 FG, 6-7 FT), but was also responsible for six of her team’s 25 turnovers. UCF’s Tolulope Omokore had 11 points and 10 rebounds, and just two of Central Florida’s 21 turnovers. The final score: 61-57. It was the first tournament win for Central Florida, and the first 20 win season in school history. First year coach Katie Abrahamson-Henderson who inherited her entire team, was thrilled at their success. UCF moves on to face UConn Sunday at 5 p.m. (ESPN2). Connecticut guard Kia Nurse returned from an ankle injury, but against Tulsa, coach Geno Auriemma decided to use her sparingly. UConn, came out slowly, missing a few defensive rotations early. To their credit, Tulsa capitalized with a couple of threes. The Huskies regrouped quickly, however, and led 25-12 after one period. Three minutes later it was 36-15. You get the point. UConn was UConn. Tulsa was everyone else. The Huskies have never lost an AAC game. They have never lost at Mohegan Sun Arena. They have not lost since November 23, 2014. Tulsa was not going to change that. Then it was 58-24 going into the locker room. UConn shot 61 percent for the half, Tulsa 31 percent. The highlight for Tulsa was the tough interior offense of 6-2 freshman Kendrian Elliot, who powered the ball into the hoop through a triple-team on consecutive possessions, before sitting with two fouls for the rest of the half. Tulsa simply could not defend UConn, but they showed resilience and fearlessness on offense. Elliott and 5-4 Erika Wakefield showed considerable skill threading between defenders to score in the paint. When four UConn starters sat before the end of the third period, it was nice to see Tulsa Coach Matilda Mossman also sub in bench for a short while, spreading the tournament experience around for her players. Score at the end of three periods: 84-41. 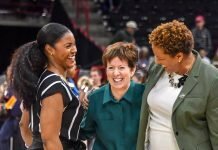 The conference tournament is the only time all season that teams play consecutive games (three for UConn if they win out), and Auriemma allowed his starters to rest for the entire final period. Halfway through the period, it was left to the two benches to finish it out. UConn had 27 assists on 36 baskets. Napheesa Collier led the team with 24 points and nine rebounds. The Huskies were 20-20 from the free throw line. UConn moves on to play Central Florida on Sunday at 5 p.m. (ESPN2). Nobody scored until 6:22 in the first quarter. And that was a single free throw, the second of which was missed. The teams combined to miss twelve consecutive shots, before Temple’s Alliya Butts finally got a layup to go through the net. The score was tied at 15, at 19 and at 28. At the half, Temple led by just three, 28-25. These two teams are speedy, athletic, and active. They just don’t shoot very well. Houston, winner of two of four entering the tournament, (half their season conference total), clearly became believers with their first ever tournament win on Friday over Cincinnati. The energy showed, as it did for Temple, but the first half was an exercise in active futility. The teams combined for 21 field goals on 58 attempts, and were a combined 6-14 from the free throw line. In the third period, the same futility generally continued, but Temple turned Houston over more frequently, hit some threes, and pulled out to a ten point lead early in the fourth quarter. Neither team slowed down, but neither improved their shooting much either. In the last five minutes of the game, Houston began to press, but for the most part, Temple broke free. Without the halfcourt defense set, Temple’s guards began to hit more shots, and Temple pulled slowly away to a hard-fought victory. In the fourth quarter, Temple finally looked like a NCAA team that they will be, shooting 58.3 percent for the last ten minutes. The bulk of those made shots were by Fitzgerald. Tanaya Atkinson, the AAC sixth player of the year (who started for the injured Donnaizha Fountain in this contest), tallied 16 points and 12 rebounds. Cardoza credited increased “maturity and toughness” for Temple’s success this year, including reaching the team’s first AAC semi-final. Certainly the team showed some of each in the fourth period after a woeful shooting night, holding off a tenacious Houston team, and hitting the shots they needed when they needed them. Houston made a statement in the last weeks of the season and in the tournament. The Cougars will return four starters, three of them currently freshmen, next season. Freshman Angela Harris scored 15 points on 7-14 shooting for Houston. Temple moves on to play USF at 7 p.m. Sunday (ESPNU). At the end of a long day of basketball, what can one say about a game with a score of 24-23 at the half? Not much. Lots more missed shots. Just futile shooting, not especially great defense. USF relies primarily on Katya Laksa for their scoring, and she had a really poor half, shooting 3-13. The only remarkable thing about this sad first half is that this was the first tournament game attended by cheerleaders and the band for both schools. Thankfully, both teams regrouped in the locker room, and the second half featured much better ball movement, and much better shooting. McKenzie Adams carried most of the weight for SMU, which made 8 of 14 field goals in the third period (.571), yet led by just five points after 30 minutes. The teams traded baskets for most of the fourth period, with Adams and USF’s Maria Jespersen leading their teams. Despite her sub-par night, Laksa continued shooting, and tied the game at 53 at 2:54 with a three off a solid screen. Laia Flores hit a key bucket as the shot clock expired to put the Bulls up 58-55 with under a minute remaining. After a stop, USF’s Maria Jespersen was fouled on a rebound, then missed both free throws, but with 25 seconds left, SMU’s Morgan Bolton forced a three into a block by Ariana Pujol. Flores and Laksa made their free throws, and South Florida escaped with a 62-55 victory. Adams finished with 26 points for SMU. Laksa finished with 17 points, but on just 6-19 from the floor. USF will meet Temple at 7:30 p.m. Sunday (ESPNU). It will be their fourth straight semifinal in the AAC tournament. The 8-9 game is often one of the most competitive, but this game was merely a dismal beginning to the tournament. Memphis and Tulsa combined to shoot 28 percent in the first half (15-53) and entered the locker rooms with Tulsa leading 20-14. Both teams looked sluggish playing in front of maybe 800 fans (still 250 more than an average Tulsa home game). The teams far too often jogged down the floor, then stood around on offense. Memphis was active and pressing on many defensive possessions, but slow on many others. Ultimately, the Tigers did convert Tulsa’s 18 turnovers into 14 points, but could not score enough in the half-court. Both teams improved a bit in the second half, and the score was tied at 43 with just 4:50 left in the game. Memphis had used up their energy getting there, and Tulsa scored on the next four possessions to lead 52-43 with two minutes remaining. After missing seven of eight threes to this point, Memphis made the last two minutes interesting by hitting 3-4 down the stretch, but could come no closer than five points. They chose not to foul Tulsa until just 33 seconds remained, and the Golden Hurricane made enough of their free throws to close out the game. Brea Elmore scored 23 points on 10-21 shooting for Memphis in the loss. Tulsa spread the scoring around more, led by Ashley Hughes’ 12 points on 5-10 from the floor. Memphis goes home. Tulsa moved on to face No. 1 UConn Saturday at 2 p.m.
Game two featured a great deal more energy and remarkable shooting for a Houston team not known for its scoring prowess (.374 on the season). The Cougars shot just under 50 percent for the first half, as Cincinnati failed to defend for a full 30 seconds on most possessions. The Bearcats, meanwhile shot just 33 percent, but somehow managed to stay close, entering the locker room down just five points, 35-30. The third period was an exercise in offensive futility, caused in part by better Bearcat defense, in part by poor shot selection, and in part because Cincinnati simply missed everything, even two footers. Cincinnati sunk just one field goal (1-14) in the period, but stayed in contact by driving the lane, getting fouled and hitting 10-13 free throws. Houston missed 15 of 20 attempts, but led at the break 48-42. The teams continued to miss many more shots than they made in the fourth quarter, but Cincinnati was slightly better, and pulled within two with 6:35 remaining. Houston, which has often given up a late lead this year, suddenly found the range from downtown, hitting three of four three-pointers in the last five minutes of the contest, opening an eight point lead with two minutes remaining. Cincinnati, still unable to hit a layup, had to foul, and the Cougars made every free throw, to win 74-61. The Cougars shot 54 percent in the first and fourth quarters of the game. Cincinnati made 26-31 free throws (83.9%), but just 8-21 layups. On one late possession, Shanice Johnson, the Bearcats scoring leader on the season, grabbed three offensive boards and missed three point-blank put-backs. For the game, Cincinnati made just 26.2 percent of their shot attempts. Nobody wins games missing 62 percent of their layups, and 82 percent of their threes. This was the first upset of a tournament that could have several. Houston moved on to meet Temple at 6pm on Saturday, and No. 6 Cincinnati was done. In a strange aberration, one of bottom-seeded East Carolina’s two conference victories was a 58-57 win over SMU in their only other meeting this season. This up-tempo game was a pleasure after the somnolent first contest of the day, although it resembled the second game in that nobody seemed able to make a layup. East Carolina, relying heavily as always on forward Kristen Gaffney’s 12 points, added another eleven points off twelve SMU turnovers, and hit 4-9 threes to take a 33-30 lead into halftime. SMU won the game in the third quarter, as they finally found the range, shooting 8-12 for the period, to take an eight point lead with 3:47 left in the quarter, the largest lead of the game for either team. Both teams lost the basket again in the fourth, which SMU won 12-9, enough for the 6 point victory that should have been easier. Gaffney finished with 24 points on 7-12 shooting, and 10-13 from the line, but no teammate scored in double figures. For Southern Methodist, 6-3 junior Alicia Froling had 23 points and 12 rebounds, while Kiara Perry and McKenzie Adams added 14 and 12 in the victory. SMU moved on to play No. 3 South Florida at 8 p.m. on Saturday.